Jennifer Ring is a professor of political science at the University of Nevada, Reno. 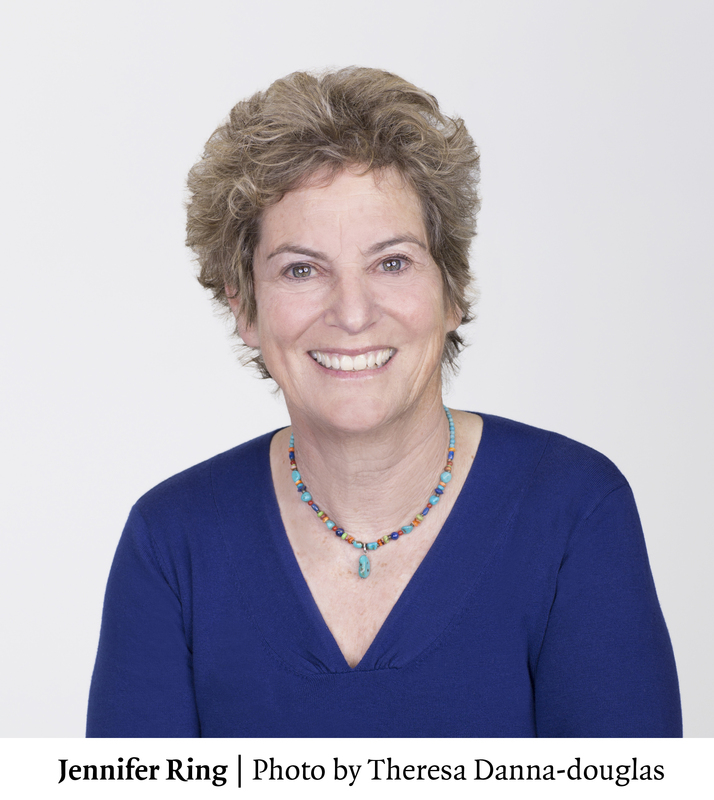 She is the author of Stolen Bases: Why American Girls Don’t Play Baseball and A Game of Their Own: Voices of Contemporary Women in Baseball, the story of the women baseballers who played on the Team USA 2010 and the Women’s World Cup Tournament in Venezuela. No, I mean women’s baseball, and Team USA has been playing in international tournaments since 2004, winning medals in every tournament they have played. But while we claim to be the birthplace of baseball, and call the sport our national pastime, our vision of baseball tends to exclude half the nation from participating. Since baseball arrived in the United States in the early nineteenth century (it wasn’t invented in the United States), girls and women have always played the game. And just as regularly they have been overlooked by the masses. But maybe that was about to change. My daughter is one of those baseball girls. I witnessed her battle to stay with the game after Little League, saw her succeed as the first girl in her state to play boys’ high school baseball, and continue on to be one of the very few in the nation to play college baseball. I thought her story was worth telling. When she first made the USA Baseball Women’s National Team in 2006, I realized that she was not alone, and set out to tell not only her story, but the stories of her teammates, who had similar struggles staying in the game they have loved since from the moment they picked up bats and balls as toddlers. When USA Baseball prepared to sponsor a women’s baseball team in the 2015 Pan Am Games, I thought something big was happening: perhaps recognition for the women who play baseball in the United States was finally at hand! The PanAm Games included women’s baseball would be included in an international, multisport event for the first time. Maybe, I allowed myself to hope, the country that claims baseball as its own will finally recognize the American girls who also claim the game as their own. Tamara Holmes, Malaika Underwood, Veronica Alvarez, Tara Harbert, Marti Sementelli and Jenna Marston, whose stories are a part of my book, A Game of Their Own, all prepared to take the field, along with a new crop of younger teammates equally dedicated to the national pastime. Last May in a qualifying tournament played in the Dominican Republic, Team USA swept to victory. Following a warmup series against members of Team Japan at Doubleday Field in Cooperstown, New York, Team USA continued on to Toronto for the PanAm Games, where they won the gold medal. 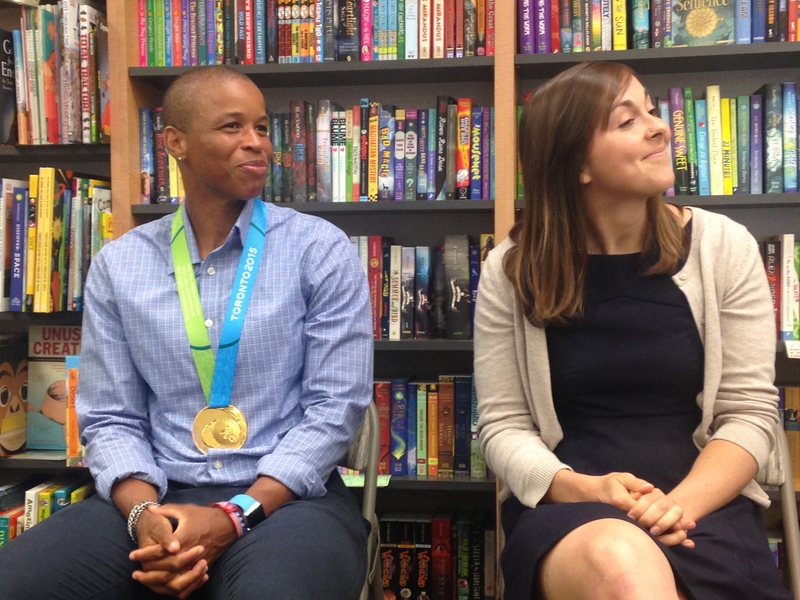 Tamara Holmes, wearing her Pan Am Gold Medal and Lilly Jacobson (Ring’s daughter), at a reading and book signing for A GAME OF THEIR OWN in Berkeley, CA at Books Inc., on July 30, 2015. Team USA defeated Venezuela, Cuba, and Puerto Rico, and then beat the Canada twice on its home turf. Canada was the only team to score a run against the US, before succumbing 11-3 in the gold medal game. The Americans were escorted off the field by a security guard, gold medals around their necks, to the cheers of parents and friends, applauded by the sell-out crowd of more than 5,000 spectators. As the team paraded their medals, I thought, “maybe I was wrong about the public ignoring women’s baseball. Maybe now it will receive the recognition it deserves.” Further encouragement came from last summer’s attention on Little Leaguer Mo’ne Davis, and this summer’s announcement that French baseball player Melissa Meyeaux had become the first woman ever listed on MLB’s list of international prospects. But my optimism has proven premature. The players of the USA Baseball Pan Am Team enjoyed the athletic experience of a lifetime and their parents, friends, and USA Baseball celebrated their achievement. But the media coverage of women’s baseball at the Pan Am Games was close to non-existent. Little League teams qualifying for the 2015 Little League World Series have received more exposure. Twelve-year-old boys are interviewed by ESPN and local news stations about being on teams headed to Williamsport, Pennsylvania. There is no girl this year to take Mo’ne Davis’s place in youth baseball, and once again, the girls of summer have become invisible. The best women baseball players in the world, with Pan Am gold to prove it, have been relegated to the same invisible place where all women’s baseball players go after a moment in the sun. It’s time to keep their histories alive, so that future generations of American baseball girls know that they stand on strong shoulders. An accomplishment that should be given recognition is the first ever complete game no hitter thrown by pitcher Stacy Piagno in Team USA history and Pan Am history!